Since IE9, async and defer have a good support for <script> element. And it’s really awesome and useful. What is async & defer exactly? 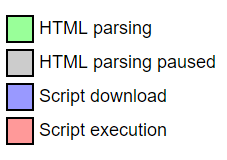 <script async> downloads the file during HTML parsing and will pause the HTML parser to execute it when it has finished downloading. <script defer> downloads the file during HTML parsing and will only execute it after the parser has completed. defer scripts are also guaranteed to execute in the order that they appear in the document. <script>HTML will wait for the script file to be loaded and executed.